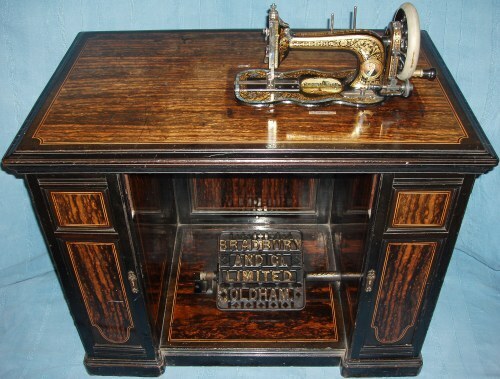 Bradbury Family No.1 Sewing Machine Bradbury Letter "S"
For information about the history of the Letter "S" and Family No. 1 click on the title above. All material copyright David G. Best 2002 - 2017 All Rights Reserved. Uniquely beautiful are the only words to describe this Bradbury. 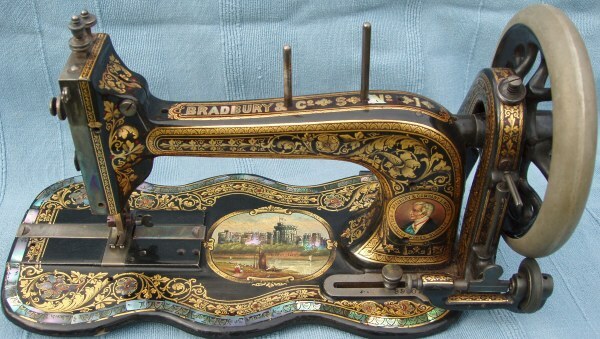 The machine is a standard Bradbury No.1 but with extensive gilding and mother of pearl detailing - even the company name on top of the arm is formed in mother of pearl. The faceplate (normally Jappaned) appears to be silver plated as do the slideplates and spool pins. 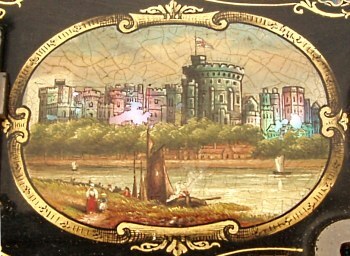 In the centre of the bed is a cartouche featuring a painting of Windsor Castle on mother of pearl which shines through in certain lights to stunning effect. Another unusual feature is a fold away handle (saxonia style) attached to the balance wheel. This appears to be a factory made and fitted item as the balance wheel has been machine cut to take the fitting. The highly ornate Drawing Room cabinet is designed to impress and be functional. The quality of the cabinet work is unusual and it is made of solid wood with a richly patterned veneer, ebonised borders and double box wood stringing. There are two panelled side doors , the left conceals five drawers with delicate gilt handles, the right the balance wheel. 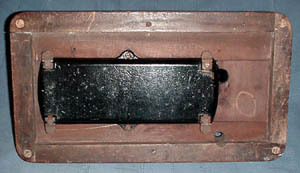 The coffin cover is not a standard Bradbury form and when the machine is in use it hangs neatly on two small gilt hooks on the right-hand side of the cabinet. The original hand book is present but has sadly lost its original outer covers, the remainer is in excellent condition. It is the standard manual for this model however the manual has gilt edges and gilt lined borders which is highly unusual. The quality of this machine is totally stunning and attention to detail outstanding and it is possible it may have been an exhibition piece. The Bradbury Research Project confirms the machine was made in 1885 the same year as the International Inventions Exhibition in London. If so it would have been highly appropriate to feature a painting of Windsor Castle, which was the principal palace the British Monarchy as Queen Victoria opened the exhibition and The Prince of Wales was the head of the organising committee. 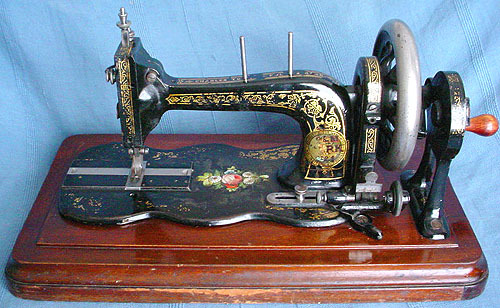 This machine came complete with its original manual which dates its manufacture to 1886 or 1887. The manual is stamped G. Baddeley, Western Road, Facing Norfolk Square, Brighton. There is also a receipt from October 1920 for a dozen needles supplied from the factory. Unlike the machines above the balance wheel is nickel plated and apart from a broken spool pin it is in excellent condition. The decals are excellent for a machine of this date, the arm is slightly worn as is the Greek Key border but the centre decal is stunning. 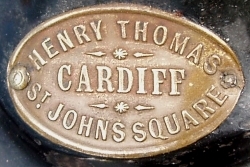 This machine dates to around 1887 and bears the plaque of the selling agent Henry Thomas, St John's Square, Cardiff - please see next page for additional details of Henry Thomas. The machine came with its orginal but somewhat battered accessory box and although the decals are worn in places the red rose decal is largely intact. If you compare this decal to that of the machine above whilst the basic rose is the same there are subtle differences. This machine bears the name of the selling agent Chas Todd, Fulham Road (which is in London). The Bradbury Trade Mark which would have been on the pillar has also been replaced but is too heavily damaged to identify. This machine would date to c1888. 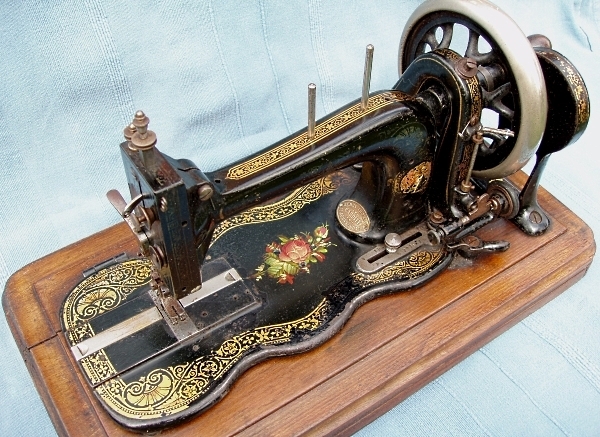 This machine came complete with original Manual which has enabled us to date the machine to c1890. The balance wheel is again jappaned black, the Decals on the bed are quite worn but those on the arm clearly show the plain leaf design. The Duke of Wellington Trade Mark is at the base of the pillar. The underneath of the base shows the oil tray which appears to have four feet, as these protrude beneath the base we believe that these we used to hold the machine in place when it was used in combination with a treadle base, note also the holes in the base for the treadle belt. 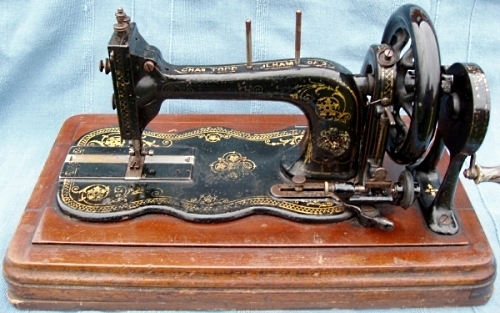 We are very grateful to Allen & Mary Franklin who kindly donated this machine to our collection. 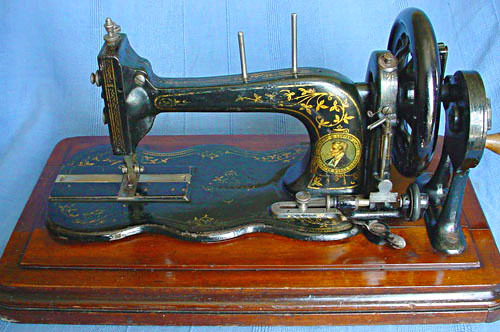 We think this machine dates to 1890. It has a Nickel plated balance wheel and although worn the centre decal is intact and features a single rose with white blue and red flowers. On the top of the arm the name Charles To?? Fulham Road appears. 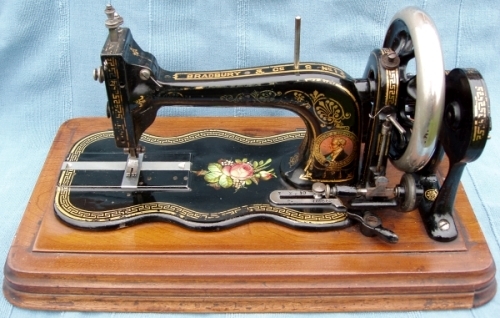 This refers to Charles Todd who was a distributor of sewing machines operating from 10 Elm Park Terrace, Fulham Road, London.